More and more is being learned about the science of our sleep. What scientist are finding is that sleep is more important than we realized and unfortunately many people have very low quality of sleep. This low quality sleep can lead to many adverse health effects if not addressed properly including high blood pressure, daytime fatigue, insomnia, GERD, and even stroke or heart attack. Dentist play a vital role in screening for and treating sleep apnea as there are numerous sings and symptoms that can be recognized during your routine cleaning as a possible indictor of Obstructive Sleep Apnea (OSA). At Kusek Dentistry we screen all of our patient's and can work with you create an oral appliance to help improve snoring or sleep apnea. We screen every patient we see for possible signs of sleep apnea because everyone deserves a good and healthy night of sleep. Our advanced imaging allow us to measure your airway to see if there is a hidden potential for obstructive sleep apnea. The software will tell us exactly how constricted your airway is, which can be an indicator for sleep-disordered breathing. Studies show that combined with a simple questionnaires, this 3D representation of you airway can be a strong indicator whether you may have some form of sleep disordered breathing. Testing for sleep apnea is now as easy as sleeping in your own bed! We believe screening patients for sleep apnea is critical and we want to make that process as easy as possible. We are able to provide our patients with a home sleep test that is comfortable and non-invasive. The test is then interpreted by a sleep physician the following day and we can visit more in-depth about the findings and options to correct the possible obstructions. Can't stand the thought of wearing a mask over your mouth every night to get a good night sleep? No problem! 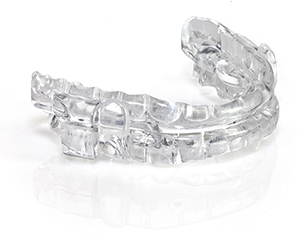 Oral Appliance Therapy has been extensively researched and found to be extremely effective at managing mild to moderate Obstructive Sleep Apnea and even severe cases when CPAP is not successful. We work with top labs to help make you an appliance that is as comfortable and effective as possible. The device fits around your teeth and moves your bottom jaw forward, which gets the tongue off the back of the throat and opens the airway. Time to silence the snoring!